The Bulldawgs won their first sectional championship on May 26 and followed that win with an upset victory over defending state champion Rumson-Fair Haven High School to advance to the school’s first state championship game. Meghan Smart, Olivia Conquest and Natalie Naticchia celebrate after Haddonfield’s 8–7 upset victory over Rumson-Fair Haven Wednesday. 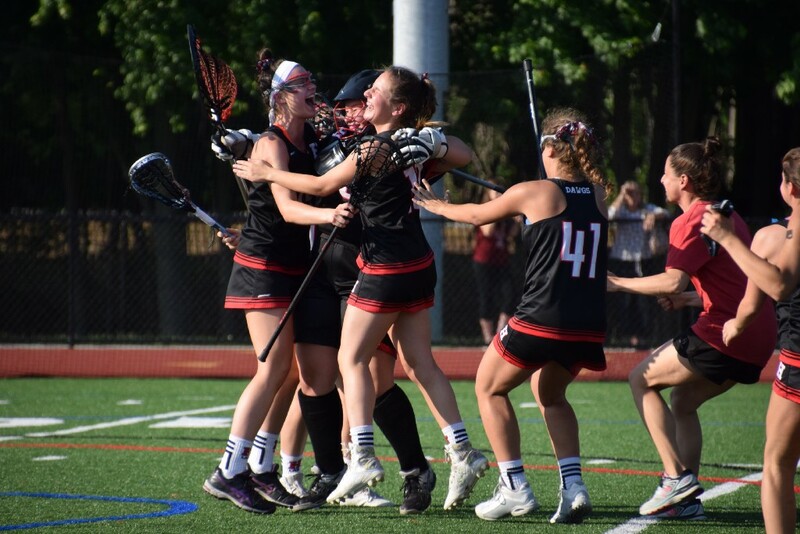 The Haddonfield Memorial High School girls lacrosse team’s 2016 season ended on a low note, as the team was defeated soundly by eventual Group II state champion Rumson-Fair Haven High School, 19–3. One year later, Haddonfield erased the bad memories of years past to have the best season in program history. 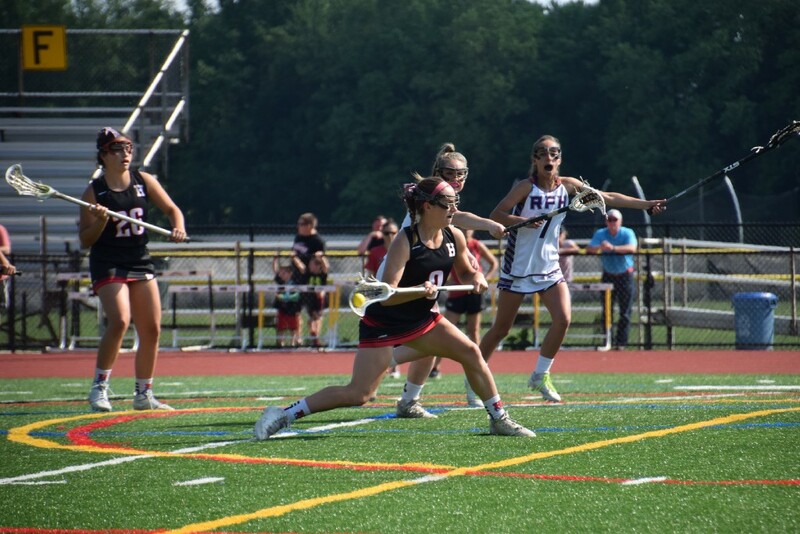 After winning its first-ever South Jersey Group II championship on May 26 against West Deptford High School, Haddonfield stunned defending state champion Rumson Fair-Haven in the NJSIAA Group II state semifinals, winning 8–7 to advance to the program’s first state championship game. Many of the Haddonfield players talk about an increased amount of confidence this season compared to last year. The Bulldawgs sprinted through most of the regular season, finishing with a record of 14–2. After early season losses to Cherokee High School and Moorestown High School, Haddonfield ran off a long winning streak. The win over Rumson-Fair Haven was the Bulldawgs’ 14th consecutive. A big part of Haddonfield’s 2017 success was the emergence of a number of young players. Junior Olivia Conquest made more than 100 saves in her first season as goalkeeper. Sophomores such as Wayden Ay, Caroline Beckett, Ashley Campo and Gabi Connor also played larger roles after getting some varsity playing time as freshmen in 2016. The sophomore quartet combined to score more than 160 goals in 2017. Head coach Jessica Blake credited the team’s only two seniors, Smart and Katie Pileggi, for being a guiding force for the younger players. “We only have two seniors and they’re very vocal seniors and their leadership is incredible,” Blake said. This season, the New Jersey Schools Interscholastic Athletic Association expanded the girls lacrosse playoffs from two sectionals to four sectionals, moving Rumson-Fair Haven to Central Jersey Group II and opening a path for Haddonfield in the South Jersey Group II playoffs. The Bulldawgs made quick work of the opposition in the sectional tournament, winning all three of their games by at least 11 goals to win the school’s first South Jersey championship. However, the team knew it could make a statement with a win over Rumson-Fair Haven in the state semifinals. Haddonfield came out aggressive, jumping out to a 7–2 halftime lead on the back of five goals from Ay, who had her best offensive performance of the season. Wayden Ay fires a shot to score the first goal of the game for Haddonfield on Wednesday. “I knew we had to take every opportunity that came to us,” Ay said. “I thought, I’m not going to let up today. Rumson-Fair Haven staged a late comeback, but Haddonfield held on for a one-goal win. Smart felt the win was a testament to how much the team has improved over the course of the season. Blake was also impressed with how far the team came in 2017 and feels the team has a lot of potential with many of its players set to return in future seasons.